A Seed2System and HGH Seed Farm, Blue Dog Hemp in Montrose, Colorado. Over the last three weeks, the Houston, TX area has been besieged by chemical fires—the latest resulting in the death of one person and the hospitalization of two others. A few weeks ago, another petrochemical facility caught on fire, consuming 11 storage tanks and sending toxic materials spewing into the air and Houston ship channel. During the initial fire, smoke billowing from the facility created a dark cloud that stretched over 20 miles across the City of Houston. These types of incidents cast a pall over the petrochemical industry and reinforce the urgency of finding more environmentally-friendly—and human-friendly—solutions. Nonetheless, our dependency on petrochemicals has proven hard to overcome, largely because these materials are as versatile as they are volatile. From fuel to plastics to textiles to paper to packaging to construction materials to cleaning supplies, petroleum-based products are critical to our industrial infrastructure and way of life. Although there are numerous companies and researchers attempting to use synthetic biology to obsolete our petro-industrial complex, much of this research is a long way from commercialization. Interestingly, however, there is a naturally-occurring and increasingly-popular material that can be used to manufacture many of the same products we now make from petroleum-derived materials—and you have undoubtedly already heard of it. That material is hemp. Industrial hemp, not to be confused with marijuana, was recently removed from the federal government’s schedule of controlled substances in the 2018 Farm Bill. The crop can be used to make everything from biodegradable plastic to construction materials like flooring, siding, drywall and insulation to paper to clothing to soap to biofuels made from hemp seeds and stalks. Porsche is even using hemp-based material in the body of its 718 Cayman GT4 Clubsport track car to reduce the weight while maintaining rigidity and safety. Needless to say, a shift to these natural, biodegradable and recyclable hemp-based products could have significant benefits for the environment and human health. From reducing the nearly 8 million metric tons of plastic that infiltrate our oceans every year to allaying consumer concerns over petrochemicals in beauty and hygiene products to the role that hemp can play in removing toxins from soil, the benefits of a more hemp-driven industrial base are hard to ignore—to say nothing of the $20,000 to $50,000 per acre that hemp farmers can make, according to Bodhi Urban, CEO of leading seed supplier HGH Seed. Yet, despite the surprising number of materials for which industrial hemp could serve as a petrochemical alternative, an array of infrastructural obstacles prevent hemp from becoming a viable challenger to petroleum-based industries. First, even though hemp was widely grown around the country up until a century ago, the knowledge, facilities and equipment required to cultivate, process and distribute hemp are no longer commonplace. This infrastructural vacuum has created challenges around everything from seed genetics to planting to irrigation to harvesting to processing to pricing to distribution. Second, the hemp supply chain is considerably opaque. There’s no assurance that the seeds you’re buying will perform as advertised. Inconsistencies in lab tests abound. No industry-wide standards exist for quality control or product labeling. The absence of this basic transparency adds additional risk and complexity to growing hemp in a way that complies with regulations and yields a consistent, high quality commodity. “Seed suppliers must work to have as little variance as possible,” says Urban of HGH Seed, who points out that there is already a $21 million lawsuit in Oregon over seeds that didn’t perform as advertised. “We’ve been able to achieve consistency and keep THC levels down throughout the duration of the harvest,” Urban notes of his strains. Delivering on these promises, he says, is vital to building trust in individual suppliers and the industry as a whole. A Seed2System and HGH Seed Farm. Blue Dog Hemp in Montrose, Colorado. Third, there is still a tremendous amount of regulatory uncertainty surrounding the industry. 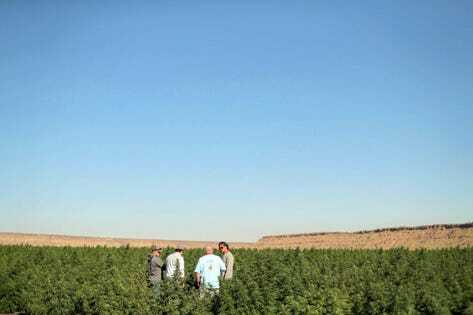 The 2018 Farm Bill legalized hemp—provided it contains under 0.3% THC (the psychoactive chemical in marijuana)—but leaves its regulation up to the states and requires state departments of agriculture to develop a plan for monitoring its cultivation. Most states are currently considering legislation to do so. The FDA also maintains a ban on interstate trade of some hemp-derived products under its purview. Although it seems like these obstacles make it nearly impossible for industrial hemp to challenge the petroleum industry, the latter is increasingly facing many of the same problems. Whereas hemp is undoubtedly becoming less regulated, petro-based industries are coming under increasing regulatory pressure. Many emerging Democratic politicians such as Representative Alexandria Ocasio-Cortez and presidential candidate Mayor Pete Buttigieg have advocated for aggressive restrictions on fossil fuel driven companies. At the same time, the equipment petroleum-based industries rely on today is becoming antiquated, as evidenced by the growing push to digitalize the energy and petrochemical value chain. Accidents like the recent ones in Texas also demonstrate that the industry’s existing safety equipment has plenty of shortcomings. Finally, as trust in the energy industry continues to decline in the United States, the agriculture and food industries are working on ways to increase that trust. Companies like Ripe.io, for example, are using blockchain to track food from farm to table. Other startups like Provision Analytics are using big data to help smaller food manufacturers gain supply chain transparency. Eventually, these same types of solutions will help the hemp industry increase transparency and traceability from seed to shelf.